It's the 25th year for the shimmery Palm Desert experience. WildLights glimmers in Palm Desert beginning on Friday, Nov. 24, 2017. 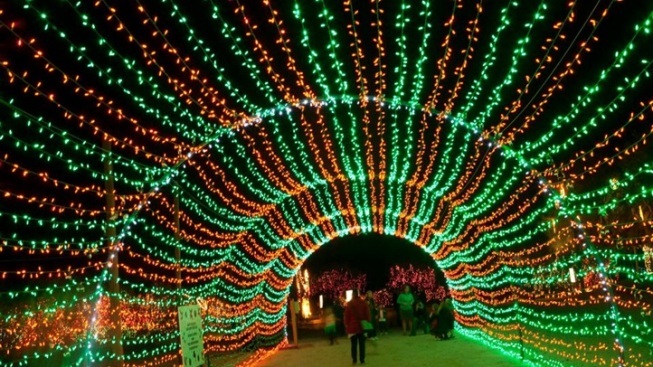 WILDLIGHTS: It's the yearly holiday extravaganza at The Living Desert, and it will once again twinkle over several select nights beginning on Friday, Nov. 24 (the final evening for 2017 is Christmas Eve). The million-plus lights wending through the path-lined park are mighty marvelous, but so are the keeper chats, the decorated G-scale model trains, and "... a herd of life-size, luminescent animal lanterns including giraffe and cheetahs..." giving more glow to the scene. Food and drink? Buy them there. Adding some splendor to a desert trip between Thanksgiving and Christmas? That can be done at The Living Desert's WildLights. The desert only lit by the moon and stars is beautiful, but when a little slice of it is festooned with lanterns and bulbs for a few weeks, that, too, can summon a sigh or three.